Ludum Dare To Believe – FEEDBACK FORM! It is us, the Button Masher Bros.! As we approach the judging deadline, we wanted to pop-in and wish everyone good luck! We screened somewhere in the ballpark of 500 entries (WOW) and featured 36 on Ludum Dare to Believe! What do you want to see for the next season of Ludum Dare to Believe? Here is a link to a Google form so you can voice your opinion! – CLICK HERE! 1) What did we do good? 2) What could we do better? 3) What is your opinion of Peach Nehi? Whatever you want to ask or tell us – we are all ears! So let us know in the comments below and help us make the next Ludum Dare to Believe EVEN BETTER!! And in case you missed it – here is a playlist for SEASON 3 OF LUDUM DARE TO BELIEVE! Ludum Dare to Believe! S:3 FINALE! Judging will end very soon! And honestly… it’s anyones game. We screened approx 500 entries in the Ludum Dare competition. At times, even that amount felt unbeatable! Shockingly enough, what we screened was only a drop in the bucket of amazing content that Ludum Dare has to offer! We strongly urge you guys to play the games, exchange ideas, make new friends, and do what you can to come out of Ludum Dare a stronger programmer/artist/musician or even youtuber! Today we present the FINALE of Ludum Dare to Believe Season 3! Remember – the fun for us does not stop with Ludum Dare! If you like us, check out some of our other content! We cover everything from retro to new, indie to AAA! And don’t be afraid to approach us with suggestions! And if you have made a game that you would like us to play – feel free to contact us! As always, it has been a joy and a pleasure presenting these videos to you guys! Happy Ludum Dare! Ludum Dare to Believe! S:3 Part 11! First off – HAPPY [INSERT HOLIDAY OF CHOICE HERE]! It’s that time of year where we gather with the one’s we love, eat delicious foods and exchange varying levels on Merriment! GIVE THE ULTIMATE GIFT OF HOLIDAY CHEER! Check out Part 11 of the Ludum Dare to Believe Series! If you like the games you see, be sure to check them out of Ludumdare.com and let the developers know what you think! Late Sunday Night Gaming — Let’s Clear the List! Come live vicariously through my gameplay on Twitch! I’ve watched the I Am Technician tutorial at least five times. I am ready. Don’t forget to play and rate my entry, “A Fine White Line”! Still can’t believe we made it! Our first Ludum Dare submission is a fact! Despite all obstacles! We were late to join the party and we had very little time to make something complete, but the theme was intriguing and we had to try! “Escape The Screen” is a tiny puzzle game, all happening inside a CRT screen. You can check our game here. But we have to tell you our story! We were on time but we couldn’t submit the game – if that’s not Murphy’s law then what is it? Then it was possitive thinking..
After that, extreme choices had to be made! We would use internet sharing from our mobile 3G network to upload our game! And… as soon as we had it all figured out… the internet was back again! At the last 5 minutes..! Is it polished? Hell, NO! But we sure had fun making it! We hope you’ll have some too while playing it! I finished up my compo entry last night. 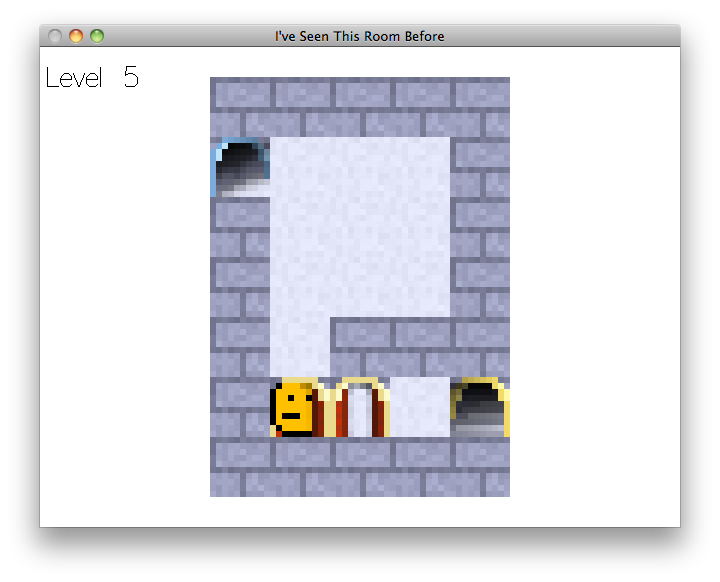 Since this is my first Ludum Dare, I overestimated how much I could get done. I didn’t get everything done that I had wanted to, but I’m surprised at how much I did finish. Finally I finished my entry for this Ludum Dare (LD31, the theme is The Entire Game on One Screen). This time, I am so exhausted that I couldn’t do any progress report during the weekend, but, on the other hand, I could finish the game, including the mechanics, graphics and sounds. My idea was creating something with artificial intelligence (again) and for some reason, after the theme announcement, I remembered that I never touched at a flocking algorithm and this would be a good opportunity for it. The game idea is to take some sheeps from one point and bring them to another, without letting them to leave the map or to be killed. The player uses the mouse to herd the sheeps, which will behave accordingly to their neighbor mates and some tiles in the environment. I drawn my first tileset! I had to redraw the tileset 2 times! I didn’t think I’d make it! This is my first Ludum Dare, and I’m amazed that I managed to make something in such a short amount of time! I’ll continue polishing it until the deadline. Ludum Dare to Believe Season 3 SUBMISSION THREAD! Hello fellow game developers, artists, musicians, and enthusiasts! The Button Masher Bros. are back and we’re ready to highlight our favorite games made in Ludum Dare 31! This year we’ve decided to do something a bit different! We’ve made a fancy google document for people to submit your games to! NOTE – if you have multiple submissions, simply put a comma and line break between entries! IT’S NEVER BEEN EASIER TO BELIEVEEEEE! We’ll be sure to post again once the submission deadline arrives, so don’t fret if you don’t have much to submit yet! We are extremely excited to bring you Season 3 of Ludum Dare to Believe and we wish all of the contestants the very best! Looking forward to seeing what you guys have in store for us and making some new friends! The idea of the game is to defend Sol by collecting dark matter and using it to construct defenses. Its a super simple art style (Im a programmer) but I think it looks slick. The dots are stand-ins but the red dots are the enemies marching towards Sol and the blue dots are your defense pawns. You can upgrade the pawns shields (green circles) and upgrade the weapon types. Oh yeah, the big orange line is when an enemy hits Sol’s shield, Sol fires out one huge beam that destroys all enemies in that line. Poo Dee Pie – BIG NEWS! WIP Build Up for Play! This is a WIP build of our game for a Jam entry into Ludum Dare 31. PLEASE NOTE: The game itself has not been balanced or tweaked at all yet, this build is all about making sure the major pieces / features are all set up. Check out the screenshots of game play below! Here, this is our game desing lol. We will be doing a christmas game cos’ we like christmas and we voted for SNOWMAN but thats ok :). but its 4.13(pm?) here so i’ll go to bed now.